This paper is not entered as second class mail. It's a first class newspaper. 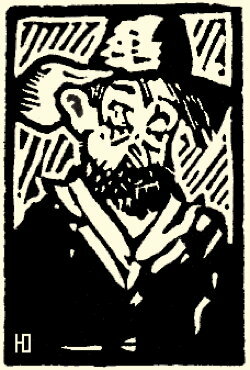 PICTURES ARE BY THE AUTHOR, MANY OF THE WOODCUTS—I did all but the spelling. Most of this material, pictures and writing is copyrighted.—And branded. P. S. If the answers don't fit, maybe a pack rat beat me to the mail. Typography on this paper by Guy A Genung, Green Lantern Print Shop, Corona, Calif.
Presswork by the Times-Mirror, Los Angeles, Calif.
After printing Packet No. 2, I received some comment as to my spelling, so in Packet No. 3 I made this boast: "For such a small paper I give you a generous amount of typographical errors." After No. 3 hit the water holes, a letter came telling me some of my news was not TOO FRESH, so now I make this claim: "The news in this paper has been tested by time." I've got a dog names "Whiskers," given me because he wa supposed to look like me But I can twist his whiskers and make him look like Steve Ragsdale. He's smarter than the two of us Old Timers. He don't drink (making him smarter then me) and he don't worry none about the world as it is today, (making him smarter than Steve Ragsdale). Our desert is a great place for dogs—no fleas! 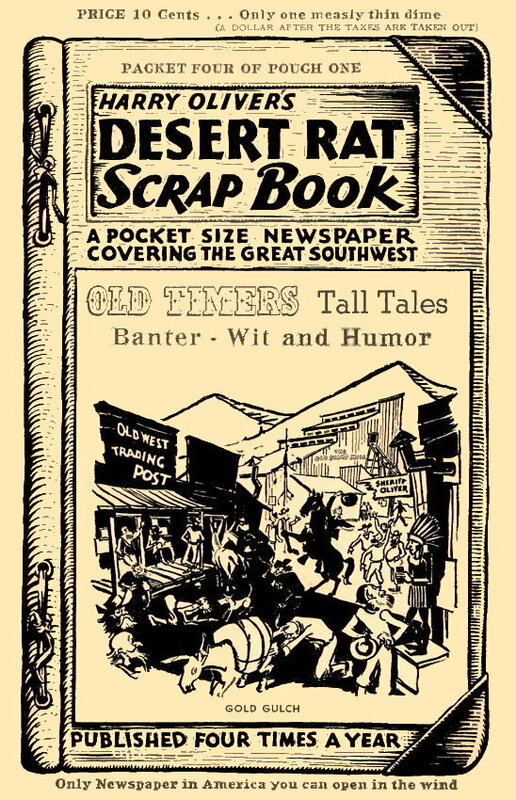 It only took 15 months for the Desert Rat Scrap Book to get to be a YEAR OLD. 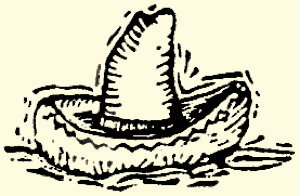 To while away dull evenings, the householders in Fred Myers' neck of the woods have been putting on Mexican jumping bean races. One contestant won three races straight before Fred discovered his entry had been pre-heated. Doesn't seem like anything's on the up and up anymore. —Matt Weinstock — Daily News, Los Angeles. 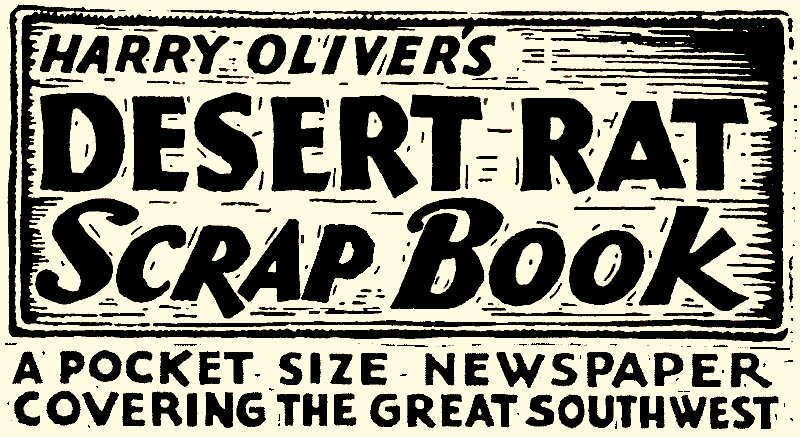 A great many of you out-of-state subscribers, from Washington to Maine, subscribed for this Desert Rat Scrap Book in midwinter, kinda wishing you didn't have to get out in the cold and chop wood. Hundreds of your subscriptions run out with this packet. I hope you will send in 50c for another year, as it's going to be cold again next winter, and there is something kinda warm about this paper of mine. Our desert is like that. 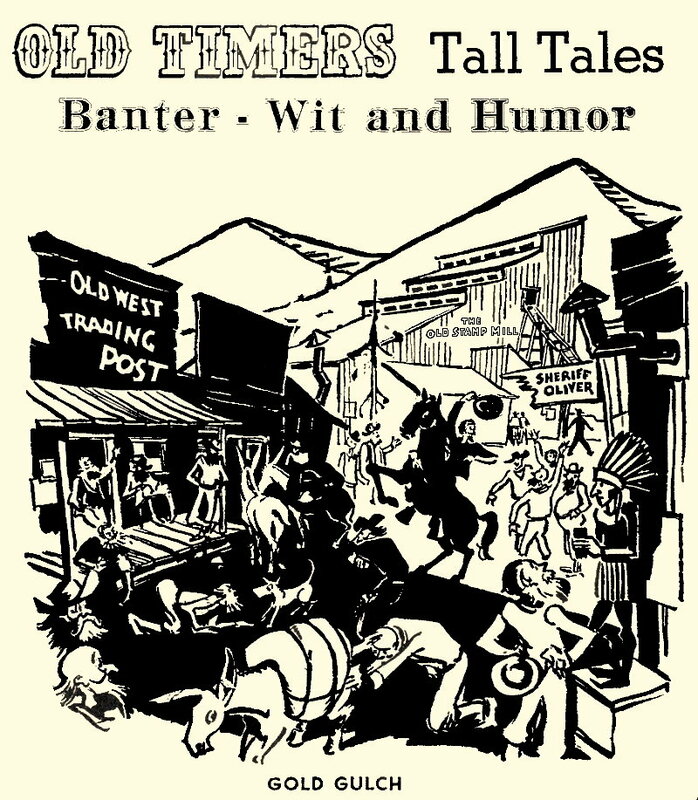 THE COVER—It's from a poster I used at Gold Gulch, my 21-acre, "Rip Roarin'st Mining Camp since '49," at the California Pacific International Exposition at San Diego in 1935. Do you remember? I have been asked to do a weekly Radio program. But because Fort Oliver is so picturesque, I will wait for television. There is no known scientific basis for the popular belief that underground water can be located by means of a forked twig carried over the surface in a certain manner. But the faith of certain people is not diminished. Some years ago the Editor wrote to three Western Universities, asking them to comment on the value of water witching. The substance of the three replies was that there is no scientific bais for water witching: that numerous large corporations, such as railroads, hire so called water witchers because there is no other way to locate water, and the fact that the water witcher knows the territory, has given forty years thought to where water should be, knows what the wells are , unconsciously while depending, as he believes, on his water witch, he scans the terrain, and releases the witch where his subconscious mind tells him the water should be. 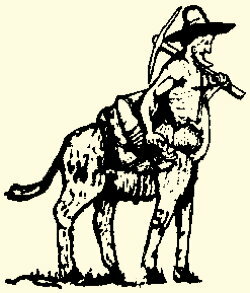 When the divining-rod racket was at its height in the Middle Ages, the dowsers not only claimed that they could locate underground water, minerals and treasure, but also stolen property, missing persons, dead bodies and criminals. 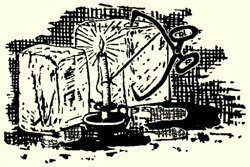 Furthermore, they not only used twigs and metal rods but also knives and forks, scissors, candle snuffers and even the sausage known as knackwurst. Stage Station Torn Down . . .
GALLUP—Gallup's oldest landmark has disappeared, with the tearing down of the Overland stage station to make way for a modern apartment building. Rock and mud walls of the little structure were three feet thick and it was built with two wooden roofs with a center layer of eight inches of sand. Heavy window frames and roof beams still showed marks of bullets dating from explosive 70's and 80's. Workmen tearing the structure down, found a log beam 35 feet in length and 14 inches square, hand hewn, and a newspaper printed in 1870. Old station well is now under Highway 66. Then there was the traveler who asked a native of a remote region in the Ozarks of he didn't have trouble geting the necessities of life in that inaccessible spot. "Yes, we do," said the mountaineer, "and half the time we do get it, it ain't fit to drink." This is No. 4, the WINDY packet. The next packet will be the BURRO Packet or No. 5. Be sure you get it. I wrote this story while in Mexico City as Art Director for the Motion Picture VIVA VILLA, (1933). The Editor of the Magazine TOTO translated it to spanish. José el torero salia a pasear todas las mañanas por el campo. Caminaba apoyando el costado derecho en la barda, y cuando veía alguna dama que se aproximaba, subia el pie sobre el bordo del camino, para dar mejor apariencia a su encorvado cuerpo. Cuando no había nadie, se echaba sobre la barda y se ponía a contemplar los magueyales. Una mañana de octubre distinguió, a través de la neblina, la silueta de un burro blanco, al que había visto desde hacía varios ías. Los movimientos del burro eran lentos, inciertos—así como los suyos. 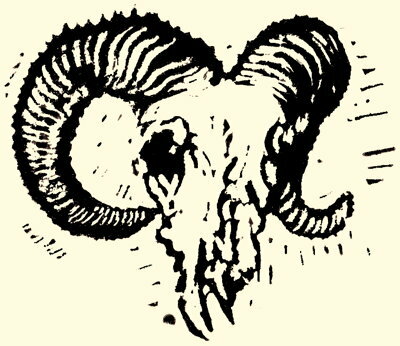 Quién podría reconocer en aquel cuerpo corvado y maltrecho capado milagrosamente, centenares de veces, de las cornadas salvajes de los toros furiosos, encendiendo la admiración de los públicos? 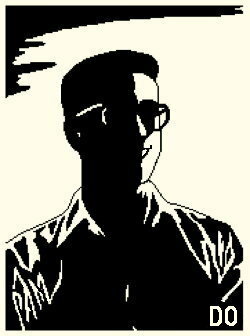 Se habrín olvidado aquellas multitudes de que el espíritu de un torero no puede ser doblegado jamás, y de que solamente su cuerpo puede ser destruído? Los peones, que lo saben, opinan que puede decirse exactamente lo mismo de los burros. Después de convencerse de que nadie contemplaba sus ridículos esfuerzos, José bajó a los magueyales, flanqueados por los magueyes más viejos, cuyas espinas amenazaban a los osados que intentaran acercarse. Pero José descubrió un pasadizo en el formidable cercado, y por él se llegó hasta el burro, que no lo vió. Tal como José lo había pensado, el burro estaba ciego —ciego y lo ponían a pastar en un campo pleno de estiletes prontos a hacerle daño! José condujo al burro hacia la salida. Aquellas finas puntas de los magueyes parecían maliciosos ojos de espías. Pero no. Eran diez mil puñales dispuestos a herir a una pobre bestia ciega. El doctor ha dicho a José que use un bastón y que haga ejercicio todos los dias, aunque no mucho, al principio. José ha arrojado el bastón por la ventana tan pronto como ha salido el médico. Y ahora, caminando con una parte de su cuerpo apoyado sobre el lomo del ciego amigo, se siente como antaño. Piensa orguillosamente; ¡ved cómo nos ayudamos el uno al otro! Y es feliz. Tanto el especialista que cura a José, como el veterinario que atiende la vista del pobre burro, han predicho una curación segura para ambos . . .
Pero el especialista nunca diráa a José que los ojos del burro han sanado desde hace un mes. La sabiduriía de los doctores y de los burros es profunda. Dry Camp Blackie is an expert at collecting nothing. Says he's sorry for those rock hounds. Being a rock hound is a hobby you go goofy about to keep from going nuts about things in general. Rock hounds carry pretty rocks home like pack rats, and don't know what to do with them. Says somebody ought to get busy and teach them to put their choice rocks to some purpose, instead of sticking different colors in dabs of cement, which is as inartistic as Junior's mud pies. Says he tried to collect folding Wampum once, but he spent all of his best specimens. Dry Camp Blackie has two turkeys. One he calls "Christmas," and the other "Thanksgiving." He also has an ornery rooster he calls "Any-Sunday." He is apt to call his rabbits "November," "December," "Enchilada," or "Tacos." I can understand all this. But knowing Blackie, I can't understand why he has named that nice chuckawalla that suns himself on the rocks by his shack "Fourth-of-July." Guy Williams says that the Grapevine pack rat "Mike" is a piker. 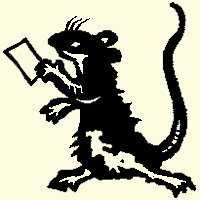 Instead of making away with nice new type and eating the kerosene-flavored glue composition off the press rollers, his pac rat helps out by bringing home the bacon as it were. Guy had one of these fleece-lined khaki oats of cold weather. This year when the mornings got chilly, Guy took the coat off its nail and saw there was something peculiar about the hang of one sleeve. The whole thing was ballooned out of shape. A pack rat had found an opening in the lining and had filled the sleeve with corn flakes. That of itself would not be a feat for a pack rat. What gives the story 'class' is the fact that Guy has not had a package of cornflakes in his house in years. The nearest neighbor, the Duke Ranch, a good half a mile away—separated by a well travelled road—might have been the source of the flakes. 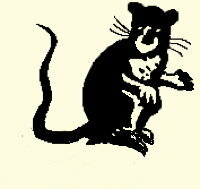 With only what he could carry in each cheek, dodging cars, cats and dogs, the number of long tiresome trips the rat had to make to fill that sleeve, puts a strain on the imagination. 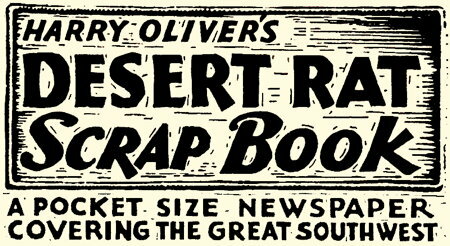 —From The Desert Grapevine, Lucerne Valley, California. The last frontier of the Mojave. Editor of Palm Springs swank press, THE DESERT SUN, recently referred to our desert Road Runners as Street Walkers. Glad I live where we have ROADS! Charles Funk, the Dictionary maker, who knows 25,000 words, started his career as a mule skinner Cussing mules sure enlarges one's vocabulary. Dear Harry — If you use this I'd suggest calling it CHAPARRAL. But suit yourself. You have a paper that's like a little cool whirlwind on a sultry day. May it keep on whirling! 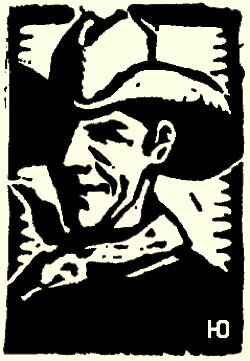 T. H.
As someone said in the last Packet, Charlie Russell, known to every Montanan as The Cowboy Artist, was a genius. When he went into the art store for paints the clerk would ask, "What colors, Mr. Russell?" and Charlie would tell him, "Let's see some." He would unscrew the top of a tube, squeeze out a drop on his finger tip. "Nope." He'd try another tube. "That's it," and thus on down the line. When he went out, his finger tips might be blazing with rainbow hues but he had the colors he wanted, the names of which meant nothing to him but whose value he knew so well how to manipulate. Up in the Bighorn country, almost within site of the Custer battlefield, I found a little valley, indescribably tranquil and virgin and remote. the feeling came over me that no white man had ever set foot there. The place smelled all Indiany. Never a squirrel or chipmunk or wood rat did I see; my only companion was a little grey bird that straightway adopted my tent pole for a perch. Every morning promptly at sunrise he woke me with his thin, plaintive voice "Tee-wee, te-wee, tee-wee," it went. He kept it up for exactly 17 minutes by my watch. The rest of the day he either dozed on the tent pole or hopped about silently over the ground, looking crosseyed for bugs and spearing them with his needle of a bill. Then every evening, just 17 minutes before time for sunset, he mounted to his perch and started chanting his notes again, only this time in reverse—"Wee-tee, wee-tee, wee-tee." As the sun sank behind the crest of the piney ridge he ceased, and went to stabbing bugs. Those evening notes were more plaintive, if anything, than the morning ones. Listening to them, and watching his breast rise and fall in rhythm with the accents, I grew melancholy. Finally I couldn't stand it, so I packed up and left the little valley with its little 17-minute bird and made camp over on the Rosebud, near a crow rookery. From my book "99 Days in the Desert" Published by Guy A. Genuine, Green Lantern Print Shop, Corona, California. There's a light tonight in Catnip's cabin—Captain Catnip Ashby—and the whole valley is glad he's back. That sleepy, sympathetic-looking dog of his'n that's been at the Busy Bee while Cap was gone, is back with his old master. And the three cats that was kittens when Kactus Kate took 'em from the Captain to keep while he was gone—they're back, too. And it won't be long till all the stray cats and dogs and burros in the valley will know he's back, and will be headed for his shack. His catnip beds had some water and will soon be supplyin' catnip for anyone who will call for it. Three months ago Captain Catnip left his cats and dog — left 'em with tears in his eyes. He was goin' to surrender. And marched away to live in the old soldiers home. We thought then that Cap would have to be counted with the old-timers that used to be. Then yesterday when everything was dozin' as it always does around here, that dog of his'n jumped straight up about ten feet, and with a yelp, and a bark, shot outside and up the road. I almost fell off the ladder I was on where I'm tryin' to catch a centipede that's got in between the macaroni and the prunes. I tried to get outside to see whatinells up—and there come old Cap Catnip Ashby himself with the dog cuttin' dadoes around him, with his corn cob pipe teetering up and down in his mouth like he was going to cry. Later, with the dog on Catnip's lap licking his face, and me obeying orders by opening a can of corn beef, he tells me about the soldiers home — about all the radios they got. The moving picture show at the barracks, the tunnels under the street, the electric dishwasher, ice machine, steam heat, and the other modern conveniences. "An' you left all this easy life to come here in the desert?" I ask. "You see," he said, "there was a rough-riding Spanish War sergeant in charge of quarters and he threatened to take away my extra pillow and chewin' tobacco if I didn't get rid of the cat I was keepin' out under the bandstand. That's why I'm back here in the desert where you don't haveta bootleg cats, and there's lotsa places to spit." 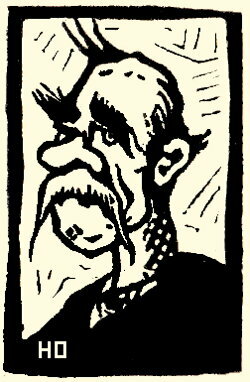 Old Don Across-the-lino was a-telling as how he could go back across the line to Mexico now because the hombre whose politics was so different from his had jumped out of a window and run the spike of a century plant through his middle. Not knowing just what this meant, no one commented on it, as we don't claim to know Mex politics none. So we just sat kinda wonderin'. There was a regular bunch of Borego shade hunters sitting on my big porch here at the Busy Bee Store, and me being the store keeper and not liking the hush, I was glad when that old philosophizing Lemanitin Lem takes us out of it, pointing to'rd the century plants alongside the bunkhouse and saying there's two of them getting ready to bloom. Getting out of earshot from old Don Across-the-lino, Haywire Johnny, my helper, asks Lem what he thinks about the century plants mixing into Mexican politics. "Why not?" says Col. Kashin. "We in this country don't know nothing about them—all we do is plant them to keep people away from cutting too close to corners. While in Mexico there's haciendas what's got fields of them as big as seventy-eight miles square. 'Maguey' they calls them and the maguey is to the Mexican what the coco-palm is to the South Sea Islander . . . out of it they make cloth, rope, and a lot of things. 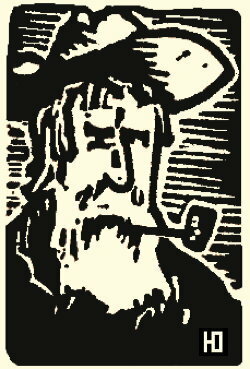 As all sat, the Colonel started again: "Cloth, rope, a sort of tapa cloth paper, shingles. In one little pueblo I saw their great leaves used as spouts or bola-aguas. And they get from it that tequila that's lots better then whiskey, pulque used like beer . . . and I saw at one hacienda the dry, ball-like centers used for beehives. Also they use the dried leaves for fuel. The pulque industry is tremenduos at the hacienda where I stayed once. They ship fifty barrels daily. Their maguey fields cover an area of miles, hundreds of peones work the fields bringing in the pulque on burros, and each night after they pour it into great cowhide vats they go into the stangest barbaric song—a wall that makes you think of Africa. It's a sort of thanksgiving chant three or four hundred years old. "You would like pulque as it is brought in—sweet like maple sap. But it is poured into vats with other two-day-old pulque which works (like sour dough of the north) and the next day it is shipped to town. Getting up and pointing to the plants that had started this talk, he went on: "The maguey is like the century plants—takes seven years before it gives its milk and then it dies and here is what is done. The plant makes up its mind to give birth to a blossom, but mister man knows that when the center leaf has a certain twist it is time to chop into the center. This makes the plant mad (an abortion), and it has a kind of a vegetable boil. This is taken out and all the milk and sap that was to make the grand blossom is gathered each day by means of a long gourd. For five months this vegetable cow gives and gives. "Well," says Lem, "It's taken these two seven years to get ready to bloom; there ain't going to be no operation. How long do you expect it'll take them to run up their twenty-foot shoots and blossom?" "That's a gamble," says the Colonel. "Maybe a foot a day. But it's hard to say, cause these are the first ones to bloom here in Borego where you have to use a stump puller if you don't pull your carrots up in time." About an hour later, Col. Kashin's got a pool all figured out, and Haywire Johnny's got two new fence boards marked off with black paint every six inches, standing against the building, alongside them century plants. The boys all put up fifty cents. They've named one plant Yellow Streak, and the other Blue Fellow, and I know as they left for home there'd be two weeks of this century plant race, and plenty of talk at the Busy Bee store. Just about dark, Haywire Johnny comes into the store a-hollerin' and a-holding the seat of his pants, wanting me to put some iodine on a spot he can't reach. He limps out again, going over to the century plants, saying, "There weren't no particular rules down for this race." Then I see it all. He's got a sack of that plant fertilizer, and the hose is a-running. While helping his favorite Yellow streak, he backed up and Blue Fellow pecked him below the belt. Looking south I could see Don Across-the-lino, silhouetted against the sky, headed south, for the land of the maguey. The Old Fashioned Western Type you find in this PACKET has come to me from Santa Fe, New Mexico; Yuma and Tucson, Arizona; Austin and Virginia City, Nevada; Sonora, Placerville, Sacramento, San Bernardino and San Diego, California. I wish to thank again all that have helped me, from the Newspaper Publisher to the Teen-ager whose hobby is old type faces. Watch the next Packet if your type is not in this edition. Some of this type was used in the CALICO PRINT, of Calico, now a ghost town. Some used in THE NEEDLES EYE, in the early days at Needles, California. From the Editor's book Desert Rough Cuts, A haywire History of Borego Desert, (Out of print ten years). These are the years old keeper of the "Busy Bee" store told. General Goldbraido was shot in the Plaza. His eleven brothers, all with less gold braid and in the Mexican Army, wanted him to have a funeral with as much glitter as his parading military career commanded. I wish you, too, had seen him on the Cinco Mayo, mounted on his calico charger six paces ahead of the shiny brass tubas of Mexico's crack band. Boy, he was born for glitter. They wired to Frisco for an all-gold coffin. It was to be sent by plane. 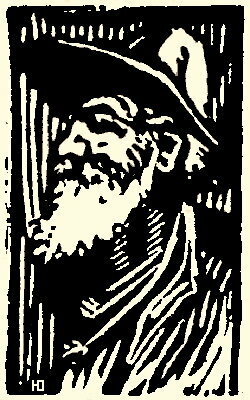 Now, I must tell you about someone on the other side of the border whose eyes had grown dim lookin' for glitter—old Dry Wash Smith. 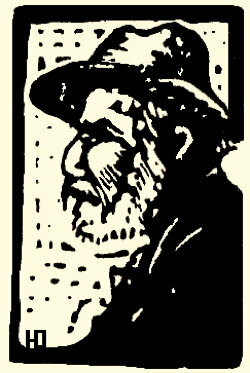 Eighty - six years old, gummin' his victuals, spent fifty-four years lookin' for gold and made six fortunes. Asbestos, talc, borax, graphite, molybdenum, a vein of copper — everything in fact, but never found the precious shiny metal. Things seem to time themselves right, down here in Borego and, of course, there's a lot of logic in this pilot's decision too. He takes off at Frisco with the golden overcoat lashed to the landing gear. Down close to the border the radio man hangs out the cabin window and yells back "Hey, this things comin' loose. We got to drop her in the sand so she can be salvaged. Speakin' about sand, we've got it here in Borego. It's just that Borego somethin' that made 'em pick the same spot to drop it in where old Smith with his dry washer had moved tons and tons of sand tryin' to get a few flakes of glitter out of it. Smith, about ready to give up, stumbled over in the shade of a mesquite, shaken and discouraged, he drained his canteen. 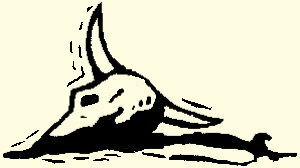 Bein' deaf he didn't hear the roar of the motor nor the plunk of the coffin as she bounced into his prospect hole. Staggerin' back he finds this shiny hunk where he'd been a'diggin'. "Gold! Gold at last, and a coffin too!" All I ever wanted was the fun of findin' it and here it is—the last chapter!" Walkin over he lifts the lid, climbs in, crosses his hands over his chest and starts to die. Every wish has been gratified. As he lays there, passin out of this world he gets to thinkin' how many times he's been fooled when he thought he had gold. So, he gets the idea of givin' her the test. Out he jumps, pours on the acid and darned if she wasn't BRASS! That was six years ago. Dry Wash is still mighty proud of the shiny rust-proof waterin' trough he's got for his burros. Sappho, his pet burro is so well trained that she shuts the lid down when the sand's 'ablowin'. The WELLS FARGO HISTORY ROOM, located in the bank's building at 30 Montgomery St., contains relics of pony express and covered wagon days; an original Hangtown stagecoach; early western franks and postmarks, firearms, pictures and documents. Open to visitors 10 to 3 daily, 10 to 12 Saturdays. WELLS FARGO BANK & UNION TRUST CO.
Salton Sea...A beautiful inland body of salt water...area 306 square miles, 250 feet below sea level. Its salt content is twice that of the ocean...Its surface the fastes motor boat course in the world. REMEMBER the cold water biscuits? (Sea Biscuits) The 49'ers packed them across the plains, and prospectors are still using them. Same outfit making them since 1801 and still can be purchased. I am eating some right now that I have had in the camp for a year and half. REMEMBER the bald headed barber that always tried to sell you the sure-to-grow hair tonic? REMEMBER the air tunnel in the Pass near Whitewater? It was a success — but the inventer sold too many ½ interests. REMEMBER the ads for Electric belts guaranteed to cure all ills? REMEMBER when all country preachers dressed like corpses? REMEMBER when the dentists filled your mouth full of rubber and strings and things, and then started telling you all the stories you told the bartender when you were getting up your courage at the corner saloon? REMEMBER when you could get a stack of buckwheat cakes that did not have cement in them? REMEMBER when you sold out and went into the chicken business? Cabot Yerxa old timer of Burro Days, (Desert Hot Springs) Got himself a Bride in Texas—Snakes and Lizards are one thing—Marrying a social belle is another—Cabot for nigh on 40 years had a large snake pit full of pet snakes and Gilla Monsters— BUT THEY'RE GONE—and he don't dare even mention 'em to that Texas Gal. 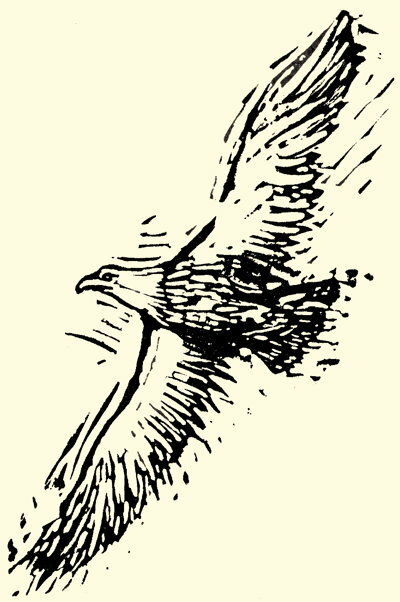 From the Thunderbird Indian Shop, Beaumont, California, I learn the only man in history who alone invented an alphabet was Sequoya, the half-breed Cherokee Indian, who created the 85 characters of his native language in 1821 . . . The height of optimism, that is what we think of the old lady from back East, Missouri isn't it, who is going after the gold in the Superstitions. No body knows how many hundreds of thousands of gold seekers have tried to find that "Lost Dutchman" mine from which Jacob Walz took out a lot of native gold many years ago, but that doesn't daunt Mrs. Middaugh. She has a map left by Walz, and she and her husband are going after that yaller metal that so many other tenderfeet have failed to find. There must be a few square miles in the Superstitions, a few hundred perhaps, but when you have a map there's nothing to it. One thing sure, it wouldn't be very profitable to try to steal that map from her; she has been practising up with her shooting irons and what she can do with a Colt's forty-five is nobody's business. With part of the gold she finds she's going to build an old folks' home here in Arizona. We wish her luck, and we are sure that after a few months in the Superstitions she'll know a lot more about the Arizona desert than she did before she left Missouri. For Two Bits (25c) Paul Smith of the Museum of Memories will mail you a copy of his "Drama of the Comstock Lode" which contains the story of this famous historic old mining town. After 9½ minutes as a guest of Parks Johnson and Warren Hull on their Vox Pop (CBS) Radio show, at Palm Springs, I received over 1700 letters. They came from every state in the Union and from Canada and Alaska, 662 subscriptions and two hat fulls of thin dimes. That's the magic of our desert air. I have had years of Magic, have seen the Great, and have read of the old Masters in Magic--but nowhere have I seen or heard of any Magician who could take a small piece of common wrapping paper, fold it three times, and make it into a National Magazine, as you have. I hope it don't get bigger, or turn into a rabbit. From a fellow Magician, DUSTY WALLER." (Ed. Note: Mr. Smith is well-known for his energetic efforts in behalf of the Desert Museum. Thousands have heard him speak on various desert subjects, both in person and on the local radio; many more have read his weekly column HAMMADA in a local newspaper. He is a graduate of the University of California at Berkeley, with a major in vertebrate zoology. He has been kind enough to furnish this edition's thirty True-or-False desert statements. Look 'em over. The Desert Rat Scrapbook would like to know how many of you old-timers can get a perfect score on this little quizz. Drop us a card with your answers. The only spider in the world which is definitely known to be poisonous to Man is the famed Black Widow spider, and over fifty authenticated deaths have been recorded as resulting from the bite of this species. The Horned Toad is really a lizard, not a toad, and it can squirt a fine jet of blood from the BACK of its eye if sufficiently irritated during hot weather. 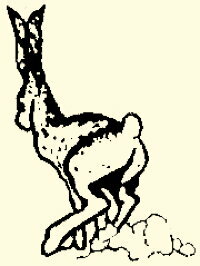 The Jack Rabbit is not a rabbit but a Hare, because it does not dig burrows and because its young can hop about and forage for themselves as soon as born. The only lizards known to be poisonous to Man are the Gila Monster and the Mexican Beaded Lizard, both of which are closely related and have their fangs on the lower jaw instead of the upper. Direct heat of the desert sun will kill an ordinary rattler within ten minutes, and a desert one in about twenty minutes. The Mohave Desert, which is spelled Mohave in Arizona and Mojave in California, is located in four states: California, Nevada, Arizona, and Utah. The Salton Sea was man-made in 1905-07 while getting irrigation water for the Imperial Valley from an old dry river channel of the Colorado River. The Ocotillo, in spite of all its long spines, is not a cactus at all but is a special botanical family by itself: The Fouquieriaeae. The Colorado Desert of southeastern California and the Gila Desert of southern Arizona are really just northern extensions of the great Sonoran Desert of Mexico. The Saguaro Cactus of Arizona is found native in only one very small area in California and it can expand its fluted sides as its trunk absorbs water after a shower. The so-called "vinegaroon" of our local deserts is really a Solpugid or Sun-spider, and is perfectly harmless to man. The Chuckawalla stores up excess food as fat in its tail, as does also the Gila Monster. The Joshua Tree, which is a type of lily, has been known to attain a height of 60 feet and an age estimated to be several hundred years. The Colorado Desert was named because of its proximity to the Colorado River, long before there was a state of Colorado. The north face of San Jacinto Peak, towering above San Gorgonio Pass, is considered the sheerest of any mountain face in America. The Sidewinder is a type of rattlesnake, and because of horned projections over the eyes, is often called the Horned Rattler. The Washington or Desert Palm, was named and described by a man who never saw it growing in the wild. "Travertine" tufa is not a coral, but a mineral deposit precipitated by minute organisms in fresh water. The bite of the Tarantula spider is definitely not venemous to Man, and the superstition for its potency arose in Europe during the fourteenth century. There are scorpions in the Tonto Basin area of Arizona whose sting is known to be fatal to Man. The only desert bird that has two toes pointing forward and two to the rear, thus leaving an X-shaped track behind, is the Roadrunner, a type of ground cuckoo. The King Snake if hungry enough will attack, kill, and eat a rattler, whose venom seems to have no effect upon the fatty body of the King snake. The common Tamarisk or Athel tree, so widely planted locally as a wind-break, is actually native to the eastern Mediterranean area. Twentynine Palms is located on the extreme southern edge of the Mohave Desert, near where the two deserts of California, the Mohave and the Colorado overlap. Petrified wood has been found in every state in the Union and in nearly every country in the world. There are two types of Mesquite trees: the Honeybean Mesquite with string-bean like pods and the Screwbean Mesquite or Tornillo with twisted and coiled pods. The little Desert Kit Fox, which in size is rarely larger than an ordinary cat, feeds primarily upon the little Kangaroo Mice of the sandy regions. Bats can ascertain their whereabouts even in pitch blackness by a natural system of radar, by emitting high frequency squeakings and detecting the echoes reflected back. The Ring-Tailed Cat is not a cat at all, but really closely allied to the Racoon, and is often called the Camomistle. A Mexican builds a dobe house because he wants a house. The American builds a dobe house because he wants a DOBE house. Therefore, let us build a dobe house that has all the romance, color, and the simple good taste of the early California house that gives us this solid, fine something to tie to. Honest construction, native building material, historical, romantic, and noble it is. A child born in a dobe home will always have something to boast of. If you look back to Packet No. 1, Packet No. 2, and Packet No. 3, you will know that you have had a bit of adobe handed to you. If, after going over this again, you want to build in this Desert with some of the nut building stuff being sold,—why I would like to ask you to drop out of this class. 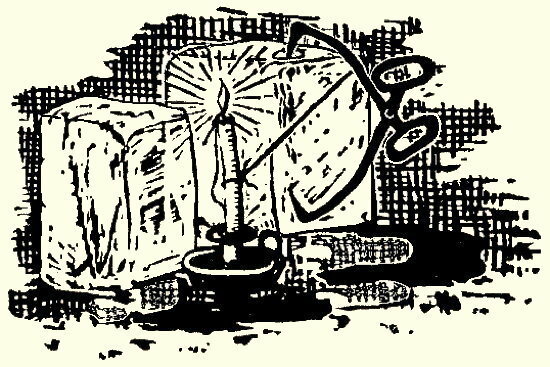 "In September, 1887, fire started on the dry shingled roof of the Globe Restaurant, and at first seemed of little consequence, but the limited supply of water at hand was soon exhausted and a sudden gust of wind fanned the fire. In less than one hour the greater part of Calico lay in smouldering ruins. "Its citizens were stunned by the suddenness of their loss, but before the ashes were cold they rallied. With the unbreakable spirit of the true pioneer they quickly rebuilt and to prevent the recurrence of such disasters, the business men agreed that every third or fourth building should be made of adobe. "Material for the first adobe house was hauled from Calico Dry Lake. Later, experiments proved the hard, red clay dirt of the town site was superior building material. "Basements were dug, the clay removed and mixed with water, then poured into forms for the walls of the buildings! Today evidence of efficiency in re-building may be seen, with gaping basements and red roofless walls containing bits of molten glass, charred wood and square nails — a grim reminder of Calico's greatest tragedy." 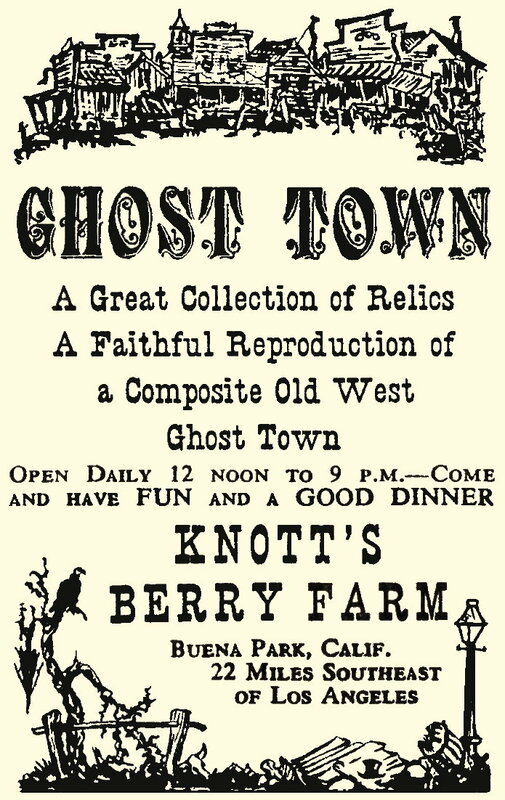 —Clipped from Larry Coke's little book, "Calico, Ghost Town,"—a great little book for 35c. Address him, Box47, Yermo, Calif.
Plug Stewart was atelling me about the time he had an argument with his wife. He got drunk because she said she hoped he would be struck dumb for saying what he did. Well, he stayed up all night adrinking and went to sleep in the new shed he was abuilding. Then the desert sun hit those new pine boards, and started a lot of pitch adropping over his mouth, and he's adreaming about his wife's hope. When he wakes up he finds that, gol-darn, he is dumb, with his lips stuck together like they were with that sticky pitch. And he has been trying for three weeks to get the stuff out of his mustache. Six foot two, 70 years old and as fine a'looking Desert Rat as you would find on a ten day trip, is C. Alexanderm, known a few years ago as ALEXANDER THE GREAT—The Magician. We have two things in common, No 1 he has been to Saudi Arabia and I want to go there, No. 2 we are both Desert Rats. Than to get to Hell on time. Alexander tells me Arabia has 9999 Desert Tall Tales to our one. K. E. N. O. — Is the Radio Station in Las Vegas the gambling capitol of the West. OLD TIMER. 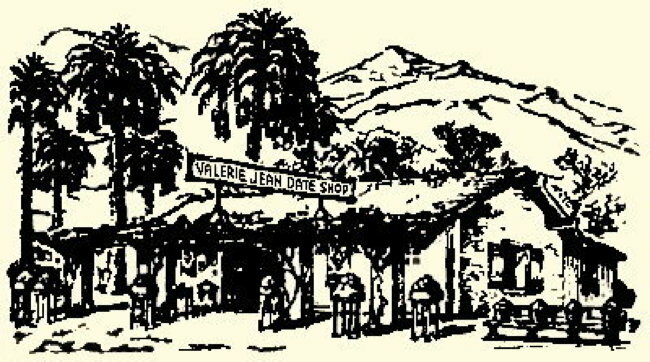 Newell Merritt, Holtville (1908) sez, the first survey of Imperial Valley was made in a saloon in Yuma, Arizona Territory. Just Send us YOUR GIFT LIST and . . .
From my book Desert Rough Cuts, A Haywire History of The Borego Desert, printed back in the days when we spelt Borego with one (R). When it's hot here it's hot! Today it's hottern' the inside of Philpott's brick kiln after seven days of firin', an' the whole of Borego is findin' it awful easy to live up to it's name. Havin' the heat is an extra excuse for doin' nothin'. In spite of the heat, Haywire Johnnie has just sprinkled the red tile floor of the Busy Bee store for the seventh time an' lugged in eight more cases of pop to fill up the ice box. Somehow the heat don't seem to bother Haywire like it does the rest of us, he bein' the only one that's doin' any movin' and the only one that ain't sweatin'. Old Doc Beatty and Colonel Kashin is playin' chess in one corner, each dreadin' the time when it gets to be his move. Flapjack an' Joe Topper is carryin' on a slow and well-worn argument about water-witchin'. It's too hot to think about anything new an even talkin' about water seems to help. 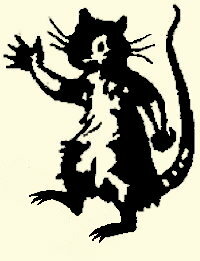 Captain Catnip is warnin' the cat not to eat no more horned toads, an' finally orders a bottle of pop for the critter. The young pilot is busy explainin' to Calculatin' Cal that tortoises is really built for plenty of speed in the water if not on land, on account of their streamline shape shell. Im just sittin' here, writin' a little. No literature today, just a few facts an' figgers like an admiral does when the navy's sinkin'. 1:57 P.M.—I look at the thermometer an' she shows 116 degrees. 2:15 P.M.—Haywire announces 119 degrees of heat and chops off some more ice for the pop bottles—old Catnip Ashby is pestered by the heat to the point of jabberin' to the cat. He's just started tellin' it that Chinamen can tell time by lookin' at a cat's eyes. 2:27 P.M.—Joe Webb says it's 121 degrees as he looks at the thermometer—slides back his sixth empty pop bottle and calls for a full one. 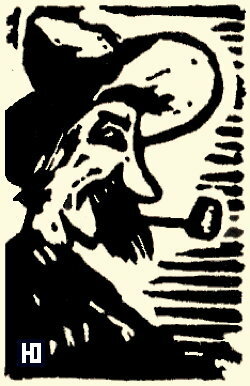 "Seven-eights of the fun of smokin' is seein' the smoke," Says Calculatin' Cal, thinkin' out loud. 2:40 P.M.—Flapjack announces the temperature at 131 degrees. "At Greenland Ranch in Death Valley, on July 10, 1913, it got to 136.1 degrees," he says. "If she keeps on goin' up she'll bust the record"
2:42½ P.M.—Someone says it's 135.5 degrees. "The trouble with classical music," says Liminatin' Lem, "is it's too hard to whistle." 3:01 P.M.—The thermometer shows 137 degrees! The chess game ends in a double stalemate an' I go over to look at the thermometer as the record is busted. It's swayin' there are on the wall and there's smoke comin' out of her. "That is hot!" I says. Then as it swings I see a little hole in the 'dobe wall right back of the bulb, where a cigarette is burning. I look at Haywire Johnny questionin'-like. "There's nothing like the power of suggestion," says he, ringin' up some more dimes on the cash register, "two hundred an' forty bottles of pop sold to them sizzlin' hombres, an' they don't even realize it's been rainin' outside for the last two hours." I didn't like the wind my first year in this desert because I lost sixteen hats. Then I found I could screw them hats on using the wrinkles in my forehead to hold them. I live in 1000 Palms and get all the wind coming down from San Gorgonio Pass, and in them 35 miles theres' nothing to stop the wind but three barbed wire fences. Of course it blows all the barbs to the corners, but it slows it some. I've seen it blow so hard from the west, the poor old sun was at least three hours late going down. Yes, sir, the wind sure did blow out here that day. Most generally the wind comes from wherever it happens to be. But talking about heavy winds,—Once over at Garnet the wind blew a cook stove 14 miles, and came back next day to get the lids,—and the poker behind the door. Our school teacher at 1000 Palms claims she scours her pans by holding them up to the keyhole. The sand coming through in a stream polishes them better then she can by the usual method. The wind sometimes moves the desert sand. Farmer down near me says he can't keep up with his farm, which took a trip north, but speculates she'll be back next week, he says, "And I can plow them." 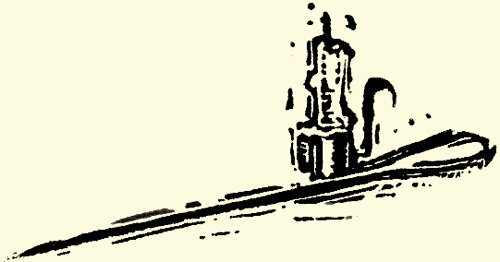 The S. P. Railroad turns its engines around so the heavy end is in the front to keep the wind from blowing the light end off the track. The wind back a few miles from Garnet, got to turning the wind-mills so fast, with so much friction, that the water came out hot. So a Real Estate man named the place Desert Hot Springs, and now he's selling lots. We don't have hurricanes in this desert because our local winds just blow them into a couple of dozen Dust Devils before they get a good start. We get used to it being windy. Why, we get so's we can wake up at night and taste which way the sand's been blowing. Yes, we know from the taste that the wind's been blowing from Imperial valley (Cow country), out Blythe way, or over the hills from 29 Palms. Of course, there's more spice in them wild night winds coming from Palm Springs. Jack Secor, of Snow Creek Station, was blown through a screen door and put together again on the other side. A silver dollar he had in his pocket made a hole in the screen that he uses to prove the story, to this day. Scotty has a hat farm along with his gas station at 1000 Palms. He's found a six foot woven wire fence alongside the station would net him about 12 to 16 hats a night and sometimes a dollar bill. Jack Diamond over at Hidden springs Ranch, used to have a lot of fine chickens but he ran outo buckshoet,ܔyes, he ran out of buckshot. You see, if he don't feed them chickens lots of buckshot, the wind blows them away. 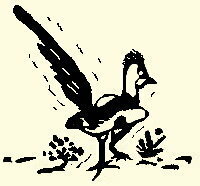 Fact is, he is starting a new brand of buckskin chickens, making them tough. Wind kept them moulting all the time, so hes teaching them to go around without feathers. The bend in the road from Palm Springs to Garnet was done by the wind. Years ago the Old-timers decided they wanted a road to the Garnet depot from the end of Indian Avenue. The road boss said, "Follow me with your wagons and we will bust her through." And he started out just as one of our sand storms came up. Well he got out of sight, and the wnd blew those horse tracks a half mile to he east, and that's why the road bends and misses the depot. Some people don't seem to like our desert. I saw an Old-timer loading all he had on his old Ford that was pointed east, and I says, "This would be a fine country if we just had water." "Yes," he answered, "so would Hell." Of course its dry in some of our desert valleys, don't rain for years, like over at Borego. I remember an old leather-faced gold miner I met over there. He had his family with him, and he says to me, "I hope it'll rain before the kids grow up. They ain't never seen none." Then there's Dry Camp Blackie, he's seen prospecting thereabouts for years. One day a drop of water hit him in the forehead and they had to throw two buckets of sand in his face to bring him to.